Yes, finally I can get a review online. As I already said in my TBR of December, I'm in the middle of my exams. I did manage to do some reading in between! Which brings me to the topic of this review: Walking Disaster by Jamie McGuire. As you might know it's the sequel of Beautiful Disaster but this time in Travis's POV. I was so eager to read this book! Which also means the story isn't different at all, of course there'll be new scenes. This because Travis and Abby weren't always together and I liked that already before I started the book. The fact that we'd be in Bad Boy Travis's head and there'd be new things about him to explore. It’s about a boy, Travis and a girl, Abby who meet in a very awkward moment. There’s blood, a smile, a stunned expression and it all begins. She's his pigeon! They meet again and it’s pretty obvious Abby has something there for Travis. He sees it, he feels it and he won’t take no for an answer but Abby only wants him to leave her alone. He promised his mother that he'd fight for the one he'd fall in love with. He swore though that he'd never just settle with some girl. Travis wanted a pigeon, someone that speaks to him without needing words. Someone one-of-a-kind. Both keep denying it until Travis finally opens up his heart. One thing is for sure, he won't go down without a battle. One he's not sure he'll ever win. But he promised... So he'll try. Will Abby be his? After I read this book, in his POV, I did change my mind a little. Not that it was bad or anything! On the contrary, this book was even better in my point of view. The way I see it, this might be all because of Travis. In Beautiful Disaster I was just not feeling him. I felt the same as Abby. He was a jerk to her some times and he wasn't always as nice as I wanted him to be. Yes, I got mad at him so many times for being mean. Although that didn't stop me from loving him, but I see now that he actually isn't such a bad boy. He's just a softy inside! He just falls for Abby and that's weird for him, it's new. He never really cared about girls and just let them out the morning after, without settling down but Abby is his weak spot. She's the one that tames him and I kind of am fan because of that. I felt like you could see and feel that a lot more in his POV. I also felt a lot more of romance and after all the hatred that I send flying to Travis while reading Beautiful Disaster... I know for sure that that actually wasn't supposed to be meant for him. Which brings me to Abby. Now I realize that actually, she's kind of the one with a temper. As you read along in Travis' head you see that he really tries hard. When he tries, Abby kind of blows him off which obviously leads to a little crack in his heart. He isn't that bad at all, he's just... soft on the inside but hard on the outside. So I kind of changed my mind on Abby, I liked her but she kind of caused most the trouble. I still find both characters very realistic though and very intriguing! Because we read in Travis' POV we also get new scenes and a lot of those scenes involve his family. I can't tell you how happy that made me! Travis grew up without a mother and with 4 brothers and his dad. He had a hard time which he explains in this book. We met his brothers and father in Beautiful Disaster but I felt like it wasn't enough. It was a little superficial. I needed more, I craved more and my prayers were answered by the Book Gods. The author gave us a better view on the family affairs! And even more details about his mother! As a reader you get to see how his father is after being bereaved of his beloved wife. How it changed him but also how his relationship is with Travis was in the past and is now. Also the brothers are around a lot. Some more than others which brings us to going back in time, getting more details of their childhood. Who took care for who after their mother passed away and what's left of that "hierarchy". Other than that the book was quite the same, with new feelings that came from Travis. I was really happy that I read this book because it just gave me more perspective. The best part in the book was the epilogue though! I can't say anything but I'll tell you I was very surprised. And happy but sad after that because then it was the end! Like really the end! Of course I also read this book because of Travis. I kind of fell hard for that guy while I read and I fell even more in love with him during Walking Disaster. I don't find him a disaster though, maybe a very handsome mess but I don't mind that at all! 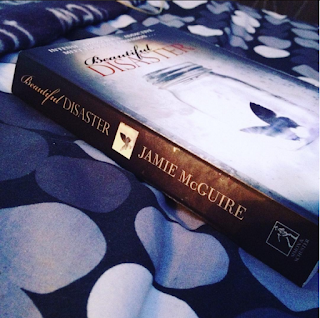 If you read Beautiful Disaster, I really recommend reading this beauty because it really completes the story more. And now I've got your attention, I just want to tell you guys that subscribing is possible! It took me a while to understand why it didn't work and finally, it does! So on your right side underneath my picture you can subscribe by mail. If you were already subscribed and don't get any mails, I'd just try again. That's how I had to do it! Thanks guys! "Every story has two sides."